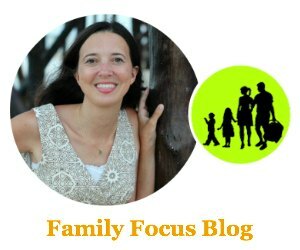 I am blogging on behalf of Walmart.com and received compensation for my time, but the views expressed here are solely mine, not Walmart’s. Shop online and save money to live better at http://www.walmart.com. I am a waste-not-want-not kind of girl, so when it comes to baby shower decorations, I say make them work double time and serve as baby shower gifts too! Truly awesome baby shower decorations shouldn’t have to get thrown away – they should be reused and keep bringing back fun memories of the shower. Planning a baby shower can be a lot of work. When it comes to baby shower decorations, you want fun and festive to coincide with practical and affordable. 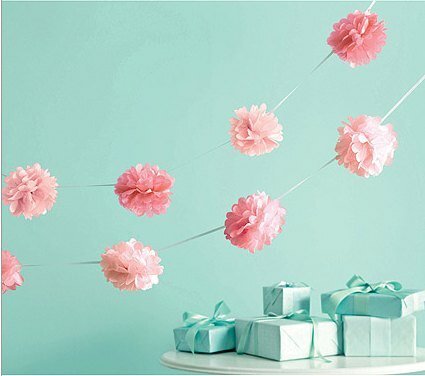 Walmart.com has tons of baby shower decorations and they can make planning for a little one more affordable and convenient. Here are a few examples of baby shower decorations that can keep on being useful to the new mother long after the baby shower ends. 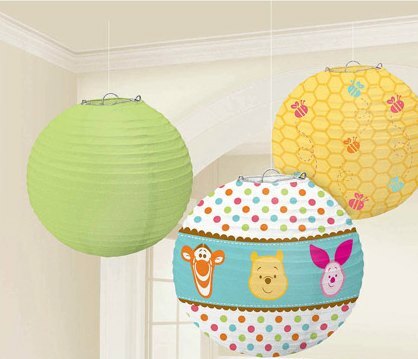 These Pooh Little Hunny Printed Paper Lanterns from Walmart.com make awesome baby shower decorations. Printed paper lantern globes are a fun way to bring color and cheer to your baby shower party. You can use pre-printed paper lanterns like the Pooh Little Hunny Printed Lanterns above or you can get solid colors and paint on your own designs so that they will match the nursery theme. They will be fun decorations for the party and then they will make great nursery decor afterwards! 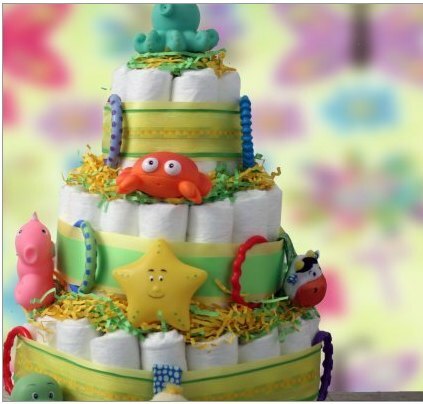 This Walmart.com Diaper Cake is a great centerpiece baby shower decoration. A big, beautiful diaper cake serves as a beautiful centerpiece, and after the party, the mother can enjoy all the baby goodies inside. You can make your own diaper cake with items from her registry or you can choose from ready-made diaper cakes. You can make your own decorative garland for your baby shower party by starting with a twine and adding cute and useful baby goodies to it attached by clothes line clips. Hang baby onesies, baby pacifiers, and small baby toys to make your own adorable DIY decorative garland. If you want to step it up a notch, you could also start with a decorative garland like the one above and add your baby items to that. This way the new mom will enjoy the baby items long after the party ends! You can make your own baby mobile or buy a pre-made one. Have the baby mobile serve double duty as a cute chandelier-type decoration for the baby shower party over a table, and then it can move to the nursery for the baby’s enjoyment after the party. Get or make an extra large baby shower card that can then be framed after the baby shower and double as artwork in the baby nursery. Everyone can sign the card, and it will be a great memory for the mom. You can also use a page from a children’s book that has a pretty illustration for this purpose. I hope you enjoyed these baby shower decoration suggestions. I’d love to hear some of your creative, awesome baby shower decorations ideas in the comments. Thanks! I love making the Motorcycle Diaper Cake for new mamas. It had everything that mom’s need and it is easy to make. It also makes a great table decoration or center piece.